Nylon Fabric: How to Sew Ripstop - Tips, Tricks & Projects | Canvas ETC. Ripstop nylon fabric is a lightweight, durable textile. It handles a variety of applications and has water repellent properties. Ripstop nylon is a woven fabric. During the weaving process, thicker threads become interwoven to reinforce the weave in a crosshatch pattern. This weave technique creates a binding property that allows the ripstop nylon to be strong and long lasting. Ripstop fabrics come in a variety of fibers like cotton, silk and polyester, however ripstop nylon has replaced some of these fibers in different applications, such as the use of parachute fabrics for the military. Ripstop nylon comes in various weights and thicknesses depending on the application or use. It is excellent at repelling water but can also come in flame retardant or zero porosity varieties as well. All in all, it is an extremely versatile fabric that can withstand and outlast the various tests of time and wear. Why is it Called Ripstop Nylon? Ripstop nylon garners its name from a special weave pattern and reinforced threads. Nylon starts as a fiber that’s eventually spun into various threads. These threads vary in size. Their thread size determines their tensile strength. The thicker the thread, the more durable it becomes. A ripstop weave become woven by using variably sized threads in a crosshatch pattern. A crosshatch pattern is interlocking. This means that the threads weave over and under one another, locking them into place when tightened. In older ripstop nylon fabrics, you can view the weave pretty clearly. With the technology that’s advanced textiles since nylon’s inception, this is harder to see with the naked eye. Since the threads interlocking within the weave are variably sized, this helps with ripstop nylons overall strength and long lasting properties. A ripstop nylon’s fabric structure holds up where other natural fabrics can’t. The ripstop style isn’t exclusive to just nylon. While nylon is typically used for the ripstop style, polyester is another synthetic fiber that lends itself to the ripstop style. These fibers become stronger and fantastic for many uses because of the ripstop process. Synthetic fabrics like ripstop nylon were first created by man and weren’t found in natural fibers like cotton. The invention of nylon fabric is rightly attributed to scientists at the DuPont Company. In the late 1930s, these scientists used petrochemicals to attempt to enhance rubber on tires and manufactured nylon fibers instead. From there, it’s properties boasted so many uses. Initially, nylon was only used for various military applications, but the civilian commercial market had many opportunities for its use. One of the first major commercial items created from ripstop nylon fabric were stockings. Stockings were initially marketed at the World’s Fair in New York City. They claimed to be the less expensive alternative to silk, with a firm durability that would withstand multiple washings. Naturally, this major advancement caused many companies to invest in the fiber for many different products and applications. While nylon’s debut aligned to the unfortunate beginning of World War II, once the war ended, nylon was still on top. Nylon stockings were selling out of stores after the war as women bought them in droves. Nylon began to slip itself into the everyday garment. From socks to sweater sets, nylon fibers were expertly woven into clothing for all. From there, ripstop nylon fabric and other styles of nylon became manufactured as needs were met. Adventure equipment, athletic gear and travel bags made from so many various forms of nylon landed on the market for all to buy. Nylon fabric became purchasable too. You could go to your local craft store to find your favorite nylon style for any project you were working on. Think of your needle. Round, ballpoint needles don’t handle this lightweight fabric well, and the best style of needle to use when sewing ripstop nylon is a sharp, pointed needle. Use a universal, size 70/10 needle when sewing ripstop nylon. How slippery is your fabric? Ripstop nylon is durable and sometimes slippery to the touch because it handles well against water. Consider using a roller presser foot to eliminate your fabric from getting stuck within your machine. Check your stitches! If you’ve set your machine to make very small stitches, you may run the risk of faster wear and tear to the ripstop nylon. Set your machine to produce no more than eleven stitches per inch to ensure durability. Be mindful on your thread type. Typically, the style or fiber of the thread will match what you’re working on, and ripstop nylon is ideally paired with a thicker nylon or polyester thread. This helps keep your project uniform and reinforces your fabric with ease. Working with other threads that aren’t matching your fabric may result in botched projects. Sewing ripstop nylon fabric doesn’t have to be difficult or cumbersome, and it’ll result in very interesting projects and applications. Learning these simple tips help you to your end result in less time than expected. Practice makes perfect! Use sharp scissors or a rotary fabric cutter to reduce fraying of the nylon. Nylon tends to fray when cut to size for your project. Keep the fabric tight by pulling the fabric on both sides of the needle instead of trying to pull the fabric through. Never pin ripstop nylon. Use a glue stick instead and to easily fasten the seams instead. Don’t be afraid to burn your edges or seams for a sturdy seal. Always exercise extreme caution when attempting this technique. Practice your stitch! Zigzag stitches help keep your seams from breaking when a stretch to the fabric occurs. Want to keep your fabric in place? Consider using double sided tape versus straight pins to keep your fabric from slipping as you sew. Sewing ripstop nylon will only become as tricky as you allow it to be. 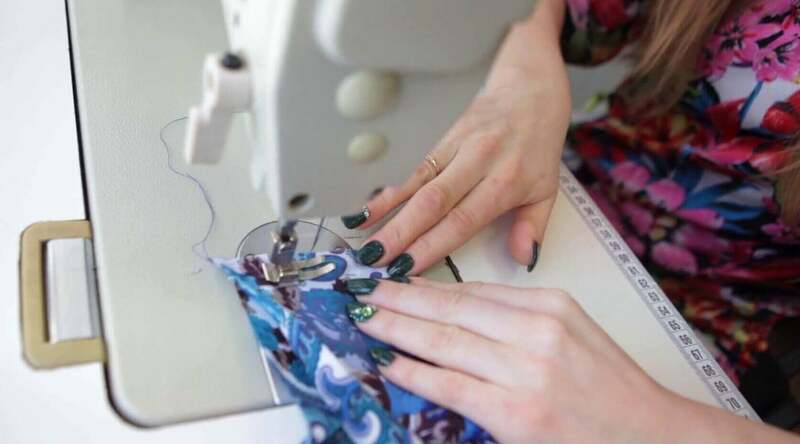 Once you’ve practiced different sewing techniques, you’ll be sewing quickly through your projects! Kites: Kites fly best with this lightweight fabric. It’s easily flown under different circumstances, as the fabric’s weave will allow it to hold up against the elements. Sails: Since ripstop nylon is repellent to water and certain fabric styles protect against UV rays, putting this fabric to the test of the seas is done with ease. Jackets: This light, easily foldable fabric keeps you safe against different kinds of weather and stands against the toughest downpours. Parachutes: Different ripstop nylon fabric styles stretch and allow air to pass through easily for parachute applications. Banners/Flags: Since ripstop nylon fibers are incredibly strong but light, it’s readily hoistable and waves well in the wind. Whatever your use, ripstop nylon fabric’s unique properties are usable for every one of your needs! Learning how to sew ripstop nylon fabric doesn’t have to be a chore. 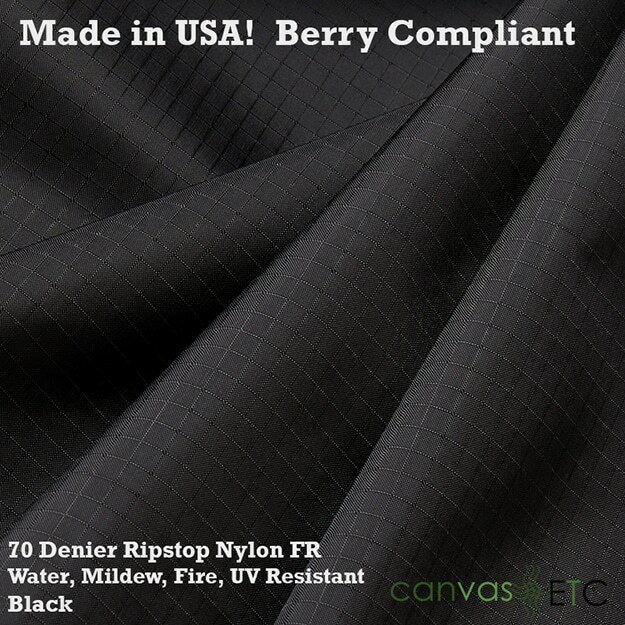 At Canvas Etc., we proudly carry a variety of ripstop nylon fabrics and many denier nylon based fabrics for our commercial and crafting customers. We also carry the thread you’ll use for your sewing projects when sewing with ripstop nylon fabric. Whatever the necessity for your current or future projects, we’ll help you find the optimal tools for your trade. Our experts try to always have the right textile for whatever project or application you’re working on. Contact us today if you have any questions or would like more information on any of our products.